So I have had this idea running through my head for a month now and I think its about time I finally started up my reading link up. My idea is to get parents to share their favourite books they have been reading with their children each week. Todays choice of book was The dinosaur who lost his roar. It is one of many dinosaur based books we own which we brought from the last book fair held at school. It tells the story of Sid, a dinosaur who enjoys scaring his friends with his roar. However he loses his roar and comes across something scary. The book is part of the Usborne first reading series so contains larger font for the beginner readers. Tom and Alfie are probably too advanced in their reading stages for this book but it really is a lovely story. The illustrations are bold and tell the story well. Tom and I enjoyed shouting out Roar when it comes up on the page which annoyed Alfie a little and probably the neighbours too. We had lots of fun reading this book together and look forward to our next story time tomorrow. I would love to see your posts on your favourite books, what you have read with your children, any book reviews, what your children love to read or what you are looking forward to reading next. It doesn't have to contain writing, you can just post a photo of you reading together if you like. I want to run this link up from Thursday right through till the wednesday after and will pick out a few of my favourite posts in the next linky. When linking up, please take a minute to comment on a least one other post and feel free to grab my Reading Together button to add to the bottom of your posts. 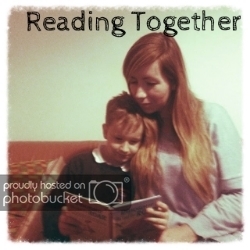 Also you can share your posts on twitter using #readingtogether and tag me @gemma_stevens so I can give you a retweet. I hope you have lots of fun reading with each other and I look forward to reading your posts. We read every night too. Just added the most recent link, a new one will be done soon!